The first generally recognized motorcycle speed records were set unofficially by Glenn Curtiss, using aircraft engines of his own manufacture, first in 1903, when he achieved 64 mph (103 km/h) at Yonkers, New York using a V2, and then on January 24, 1907 on Ormond Beach, Florida, when he achieved 136.27 mph (219.31 km/h) using a V8 housed in a spindly tube chassis with direct shaft drive to the rear wheel. An attempted 'return run' was foiled when his drive shaft came loose at speed, yet he was able to wrestle the machine to a stop without injury. Curtiss' V8 motorcycle is currently in the Transportation collection of the Smithsonian Institution. The 1907 record made Curtiss the fastest person on earth in any vehicle on land or air (the automobile record stood at 127.66 mph (205.45 km/h) (steam powered), the rail record stood at 131 mph (211 km/h) (electric powered), and in the air, where weight considerations made the internal combustion engine dominant, the air speed record was still held by the Wright Brothers, at a mere 37.85 mph (60.91 km/h)). The first officially sanctioned Fédération Internationale de Motocyclisme (FIM) record was set in 1920, when Gene Walker rode an Indian on Daytona Beach at 104.12 mph (167.56 km/h). 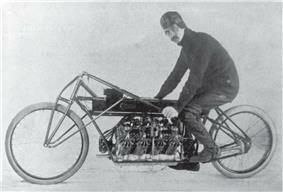 The first FIM-sanctioned record to exceed Curtiss' 1907 speed did not occur until 1930, at Arpajon, France, when a special OEC chassis with supercharged 1,000cc v-twin JAP engine averaged 137 mph (220 km/h) over the required two-way runs. In the 1930s, an international battle between the BMWs, ridden by Ernst Henne, alternated records with various JAP-powered English motorcycles (Zenith, OEC, Brough Superior). 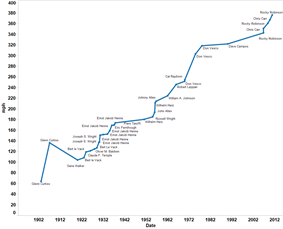 BMW set a final record before WWII, in 1937 (173.68 mph (279.51 km/h)), which stood for 11 years. After the Second World War, the German NSU factory battled English machines (Vincent HRD, Triumph) for top speed honors through the 1960s, when Japanese-engined streamliner motorcycles appeared, and alternated with Harley Davidson-engined machines through 1990. 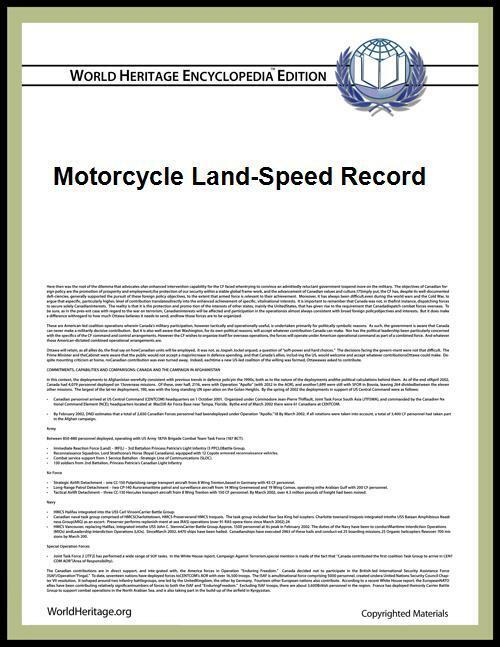 The last Harley Davidson record of 322.15 mph (518.45 km/h) stood for 16 years, before a Suzuki-powered machine averaged 342.8 mph (551.7 km/h) in 2006. Since then, the BUB team, using a custom-built V4 engine, has alternated with the twin Suzuki engined Ack Attack team. Since late 2010, the Ack Attack team has held the motorcycle land speed record at 376.36 mph (605.69 km/h). The fastest record certified by the FIM is that set in 1964 by the jet-propelled tricycle, Spirit of America. It set three absolute land speed records, the last at 526.277 miles per hour (846.961 km/h). While such records are usually validated by the Fédération Internationale de l'Automobile, the FIA only certifies vehicles with at least four wheels, while the FIM certifies two- and three-wheelers. Breedlove never intended Spirit of America to be classified as a motorcycle, despite its tricycle layout, and only approached the FIM after being rejected for record status by the FIA. Spirit of America‍ '​s FIM-ratified record prompted the FIA to create a new category "thrust-powered" vehicles to its world record listings. Further, most people think of the tricycle Spirit of America, now part of the permanent collection of Chicago's Museum of Science and Industry, as a "car" and not a motorcycle. 1937 Autostrada A4 (Italy) (Brescia-Bergamo route) Piero Taruffi Gilera 492 cc (30.0 cu in) 170.27 274.181 Supercharged four-cylinder. Taruffi famous as Grand Prix driver. 1970 Bonneville, US Cal Rayborn Harley-Davidson 1,480 cc (90 cu in) 254.84 410.37  single nitro-fueled Sportster engine nicknamed 'Godzilla' built by Warner Riley. ^ a b c d e Walker (2001) p. 188. "Then in 1936, BMW technicians decided to decrease the engine's displacement from 736 to 493. This might have seemed a backwards move, but there was a sound basis for this technical change. [...] The engine was a 493 cc double-overhead-cam with a bore and stroke of 66 x 72 mm, a Zoller supercharger mounted on the front of the crankshaft [...] This supercharging technology had been under development since 1929, when a production R63 model had been fitted with a positive displacement blower..."
^ a b c Setright (1979) p. 238 lists this as 735 cc, not 736 cc. ^ Tragatsch, caption p. 304, credits this run as 256.06 with a supercharged 746 cc, while contradicting this on the same page in a table listing the displacement for the '32-'35 BMWs as 735 cc, and as 495 cc in 1936, rather than 493 cc. ^ Setright (1979) p. 238 has this as 495 cc. ^ a b c Tragatsch (1984), p.305.